Adrian Piper joins the ranks of writer-artists who have provided much of the basic and most reliable literature on modern and contemporary art. 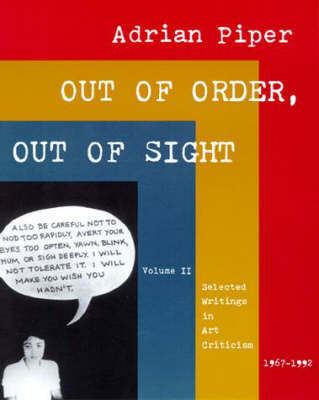 Out of Order, Out of Sight is an artistic and intellectual autobiography and an (occasionally scathing) commentary on mainstream art, art criticism, and American culture of the last twenty-five years.Piper is an internationally recognized conceptual artist and the only African American in the early conceptual art movement of the 1960s. The writings in Out of Order, Out of Sight trace the development of her thinking about her artwork and the art world, and her evolving awareness of herself as a creative, racial, and gendered subject situated in an often limiting and always absurd cultural and social context.